In 2002, Patriarch Bartholomew announced that the Holy Chrism will once again be consecrated on Holy Thursday in the Ecumenical Patriarchate of Constantinople. The Holy Chrism is consecrated by the Ecumenical Patriarch for use in holy churches for the celebration of the sacrament of Holy Chrismation.† The sacrament of Holy Chrismation is the visible sign of the transmission of gifts of the Holy Spirit upon those entering Orthodoxy.† The Holy Chrism is thus a bond that unites all true Orthodox Christians throughout the world. When the Church spread throughout the world and the number of the baptized was greatly increased, it was not possible to continue the practice of Samaria. Consequently, the Apostles introduced the use of the sanctified Chrism. The Holy Chrism was sanctified by the Apostles and was continued thereafter by the bishops through the Apostolic Succession. The "laying on of hands" was completely replaced by the Holy Chrism to transmit gifts of the Holy Spirit. 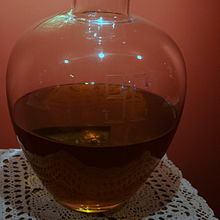 The Holy Chrism is prepared from oil and other fragrant essences, which symbolize the variety of gifts of the Holy Spirit that the chrismated Christian receives. The most ancient list of materials and the aforementioned information "concerning the materials of the myrrh," which are still used today, date from the eighth century C.E. †† This list includes the materials used for the preparation and making of the Holy Chrism. 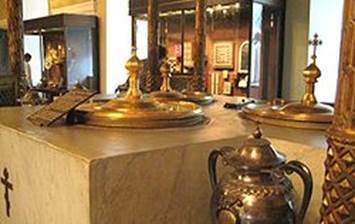 At the Ecumenical Patriarchate of Constantinople, there is an official list of kinds of fragrances, from which the Holy Chrism is made," which includes 57 kinds of elements. Information on how Holy Chrism was sanctified during the first centuries of Christianity is not available. The oldest reference is in The Apostolic Tradition of Hippolytos. Later, directions concerning the sanctification of the Holy Chrism were included in the Great Prayer Book (Mega Euchologion) and Goar's Euchologion. Constantinople presently uses this course in the preparation of the Holy Chrism. † During the nineteenth century and at the beginning of the present [twentieth] century, the Ecumenical Patriarchate made a special effort to revise carefully the prayer book containing the order and service of sanctification of the Holy Chrism.† The new revised edition was published for official use at the Ecumenical Throne.† Such services were published in 1890, 1912, and 1960. The next day, on Holy and Great Monday, after the Divine Liturgy of the Pre-Sanctified Gifts, the Patriarch enters the Patriarchal Church of the Great Myrrh, Saint George, where an appropriately decorated sepulcher and the boilers for the Holy Chrism are located. The Patriarch then blesses the beginning of the cycle of the sanctification of the Holy Chrism with a special holy service. Following the blessing, he sprinkles holy water on the prepared materials, the utensils to be used, and the copper boilers. Then, holding a lighted candle, he touches each boiler; placing pieces of old charred holy icons in them. Then the Patriarch reads chapters from the Holy Gospel. The readings of the lessons (pericopes) from the New Testament are then continued by those present, including hierarchs, clergy from the Patriarchate, as well as visiting clergy. This order of readings continues all day on Holy Monday, Holy Tuesday, and Holy Wednesday. On Holy and Great Thursday, after Matins (Orthros) at the Patriarchal chapel of Saint Andrew and after the complete vesting of the Patriarch and the other hierarchs, the procession from the Patriarchal Palace to the Patriarchal Church begins. The bells ring during the entire procession. During the procession, the Patriarch holds the small myrrh container. † The first in order of the hierarchs holds an alabaster containing pre‑sanctified Chrism.† The second in order of the hierarchs holds an alabaster containing unsanctified Chrism.† The other hierarchs hold small silver vases containing Chrism from the prepared materials to be sanctified. Twenty‑four archimandrites hold (one on each side) 12 silver containers filled with the Chrism to be sanctified.† During the Divine Liturgy, at the appointed time after the exclamation: "And may the mercy of our Great Lord," the Grand Archimandrite exclaims, "Let us attend. "† The congregation kneels, and the Patriarch sanctifies the Holy Chrism according to the rubrics. At the end of the Divine Liturgy, the sanctified Holy Chrism is transferred from the church to the Patriarchal myrrh center in reverse order according to the order of the Procession. It is in the Patriarchal myrrh center that the alabasters and the containers that contain the Holy Chrism are deposited. Following this transfer, the dismissal of the Divine Liturgy takes place. During the early centuries of Christianity, a firm tradition existed in the Church in which the Holy Chrism was sanctified only by the bishops of the Church and not by the presbyters (priests). At that time, there were no distinctions among bishops that are among bishops of dioceses and metropolitan bishops of greater church districts. As the years passed, however, the common right of all bishops was eventually transferred to the bishops of churches with greater status, that is, to the Patriarchs, and finally to the Ecumenical Patriarch, who today is able to transmit this right to the heads of local Orthodox churches. In other words, even though each bishop has the right to sanctify the Holy Chrism by his status as bishop, he is not permitted by canon law to do so. It appears that there are three reasons that restrict the right of sanctifying the Holy Chrism to the Ecumenical Patriarch. These reasons include: a) the scarcity of the materials and the difficulty for each bishop to prepare the Holy Chrism, b) the constant increase of dependence of the diocese on the head of the greater church and district, and c) the special position that the Ecumenical Patriarchate received through the centuries in relation to the other patriarchates of the East and that expresses the spiritual bond between the Church of Constantinople and the local churches of the people who received the Christian faith from its missionaries. In reality, this exclusive right to sanctify the Holy Chrism of the Ecumenical Patriarchate does not mean that local churches are dependent and subordinate to Constantinople. This act of receiving the Holy Chrism from the Ecumenical Patriarchate is a tangible and visible sign of the amity and bond of local churches, patriarchates, and autocephalous churches with the Ecumenical Patriarchate. † It is a necessary sign, not a sign of superiority of the Ecumenical Patriarchate in the Orthodox Church, but an existing visible sign of unity among the cluster of local Orthodox churches. Nevertheless, in the Orthodox Church, the Holy Chrism, in addition to being sanctified in the Ecumenical Patriarchate, is sanctified in the contemporary patriarchates of Moscow, Belgrade, and Bucharest. The Holy Chrism is also used to chrismate the heterodox (non‑Orthodox) joining the Church, and to chrismate those fallen away from the Orthodox Faith and who are returning to the Orthodox Church. † In addition, it is also used to consecrate holy churches, altar tables, objects, and utensils, and for other sacred ceremonial circumstances. In past centuries, it was also used to anoint the Orthodox kings during their crowning.